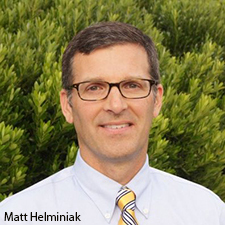 This blog post comes from Matt Helminiak, branch manager of USI Carroll Insulation in Eldersburg, MD. A few times a week, Helminiak says he receives a call from a homeowner with a mysterious problem that baffles other trade contractors. One homeowner called yesterday because water was raining out of his recessed lights in his sunroom. A call earlier in the week was because one side of the roof in the attic was fuzzy white. Last week someone wanted to know why the wood in their attic was all wet. Each time the homeowner called a roofer because they thought they had a roof leak. But in all three cases the problem wasn’t a leaky roof, it was a whole-home humidifier set too high. Whole-home humidifiers have been around for long time but have gained in popularity over the last decade. According to AprilAire.com, low humidity can increase your likelihood of getting colds, flu and other upper respiratory ailments; cause home damage; or even cause higher energy costs. Why is low humidity an issue in the winter? Cold air is denser than warm air, so there is not as much room for the cold air to hold moisture as there is with warm air. In other words, cold air has a lower relative humidity than warm air. Vapor pressure pushes from high humidity to low humidity, so in the winter your warm inside air is pushing moisture into the cold outside air. This water vapor is pushing through the walls and ceiling of your home. Attic ventilation allows the moisture that pushes into the attic of your home to escape to the outside. So if low humidity can cause health problems and make your home uncomfortable, is a whole-home humidifier the solution to life’s problems? Unfortunately in many cases, a whole-home humidifier can CAUSE problems too. The colder it gets outside, the greater the humidity difference between the inside of your home and the outside world. When the difference is too much for the house to handle, condensation can start to form on the inside of the windows. When the warm, humid air hits a cold surface like a window, it sheds out the moisture and condensation forms. But this condensation can also occur inside the walls or in the attic of the house. In extreme cases, mold and mildew can start to grow inside the walls and inside the attic. What setting is too high? If the whole-home humidifier is set too high and puts too much moisture into the air, condensation can form. It depends upon the outside temperature. The colder it is outside, the lower the humidifier needs to be set. There are two main types of whole-home humidifiers. 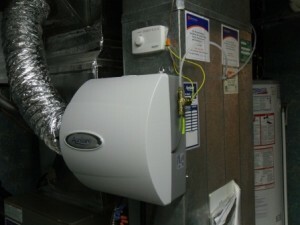 Many new models have thermostats that allow the humidifier to auto-adjust to the outside temperature and lower the moisture to avoid condensation problems. Units without the thermostat control need to be adjusted manually along with the changes in outside temperature. The right setting can range anywhere from 30 to 40% when it’s warm outside down to 5 or 10% when it’s very cold outside. When I first bought my house, the guy who installed my whole-home humidifier said I should set it as high as it goes and adjust it down when condensation starts to form on the windows. My advice is to do the opposite – set it as LOW as it goes, and adjust it up until you feel comfortable. But better to err on the side of less humidity and lower your chances of mold and mildew growth.